Elite Tree Services undertake tree felling and stump grinding for clients in Cobham, Esher, Leatherhead and throughout our wider trading area. While we are fully conversant with traditional felling techniques, we sometimes encounter projects where bringing the tree down from the base could cause damage to property or other trees. Our arborists use sectional dismantling procedures in all areas where safety is a concern. 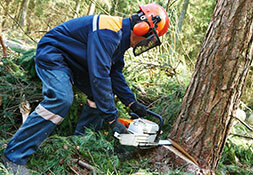 Once we have felled a tree, we can reduce the stump to below-ground level using modern stump grinding machinery. Reducing the stump eliminates potential tripping hazards to leave gardens, woodland and forestry in excellent aesthetic condition.